Subtle exotic nuances give this South Carolina home a natural and contemporary look all its own. 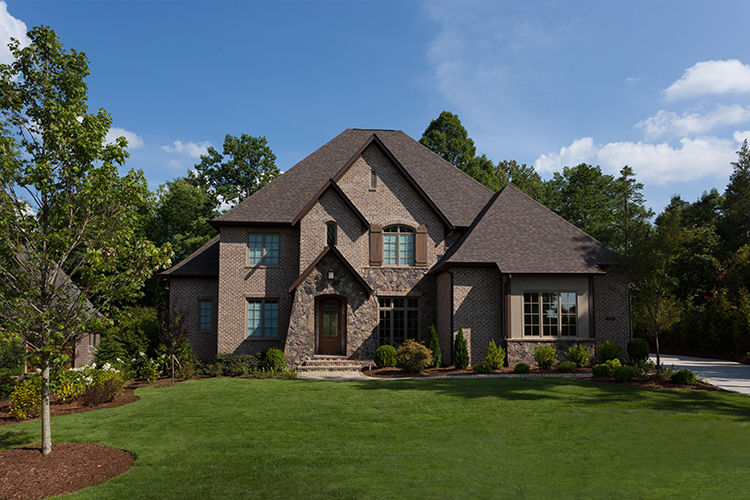 Designed by KBN Interiors, this home is naturally welcoming, warm and comfortable. Experienced from within the Grand Home is as wholesome as its earth tone palette. In the kitchen the directional pattern of striated shades grounds the interior architecture—providing stark contrast to the weightlessness of the white custom cabinetry. 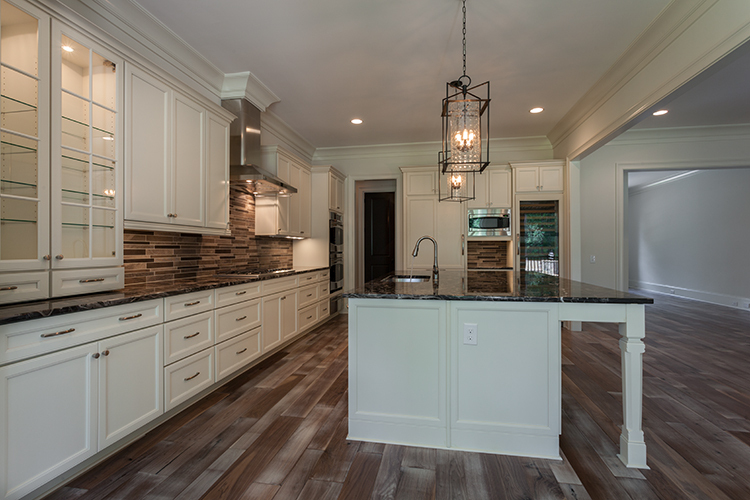 Bold earth tones in the WalkerZanger backsplash reflect the hardwood floors stained with a grey Rubio Monocoat. Fine wares in the custom built-in china hutch are easily accessed and transferred from cupboard to countertop. Overhead, contemporary Hudson Valley light fixtures shine the light on the marble countertop island. With a gas fireplace just steps away, entertaining is seamless. When the evening sets in and the weather is welcoming, guests and family can easily transition from the heart of the Grand Home to the crown jewel of the backyard. 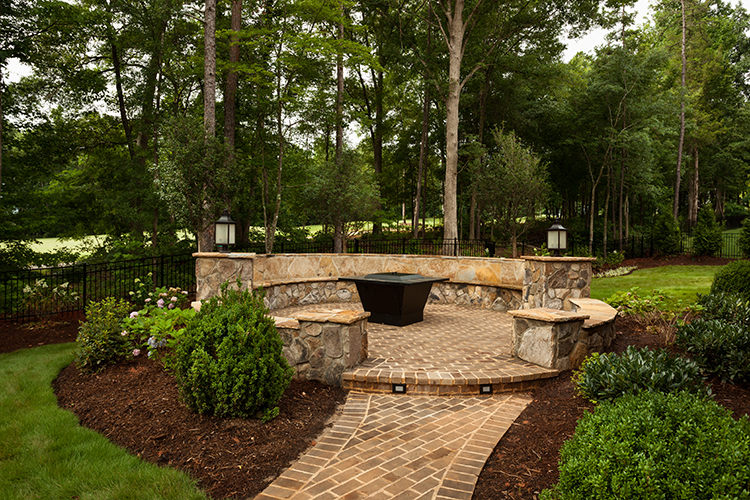 Designed for evening gatherings, the inviting Tennessee fieldstone patio features a built-in bench that encompasses a tall and elegant fire-pit. 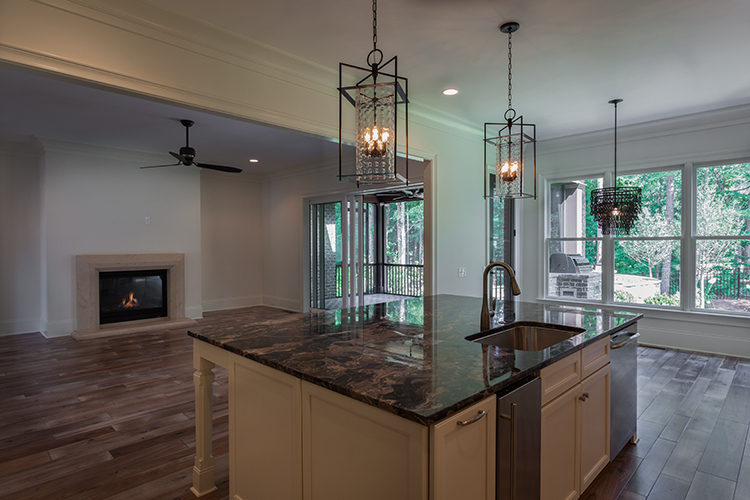 From the beautiful fieldstone sourced from the Appalachian Mountain range to the vein cut travertine tile floor each selection in the Grand Home was carefully chosen by KBN Interiors to create a dream home that the homeowners relish everyday. The design is timeless.